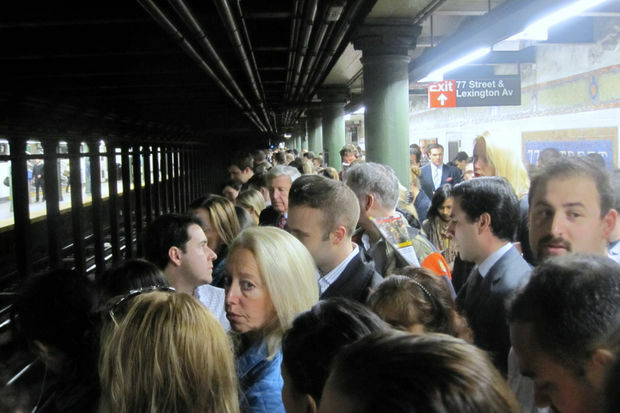 Subway delays have increased dramatically since 2012, according to the city's Independent Budget Office. MIDTOWN — Most New Yorkers can relate to the experience of craning their necks over the edge of the subway platform, staring into the dark abyss of the tunnel and trying to will a train into existence. Now, straphangers can get a sense of how many hours they've actually lost on those platforms during the past five years. The city’s Independent Budget Office released several infographics Wednesday showing the gaps in service during the morning rush hour on each line dating back to 2012. You can check out below how each line fared through the years, measured by the length of time commuters spent waiting between scheduled train intervals. The IBO previously released numbers on reduced service in a report that showed that the number of hours lost to delays during the morning rush grew by 45 percent — with an increase of 24,000 to nearly 35,000 lost hours from 2012 through the 12-month period ending in May 2017.